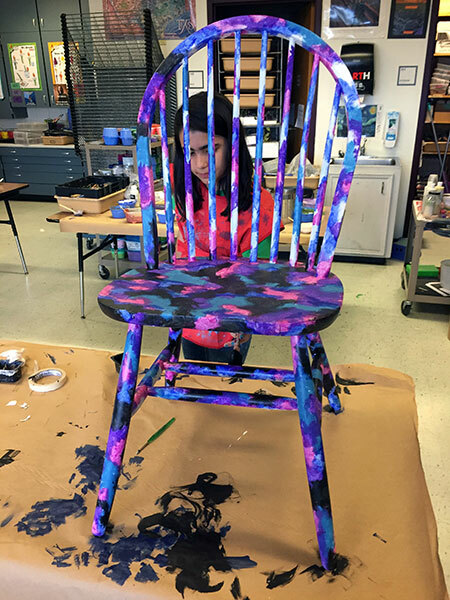 Last year's Chairity event was so successful for our art club that we just had to do it again. 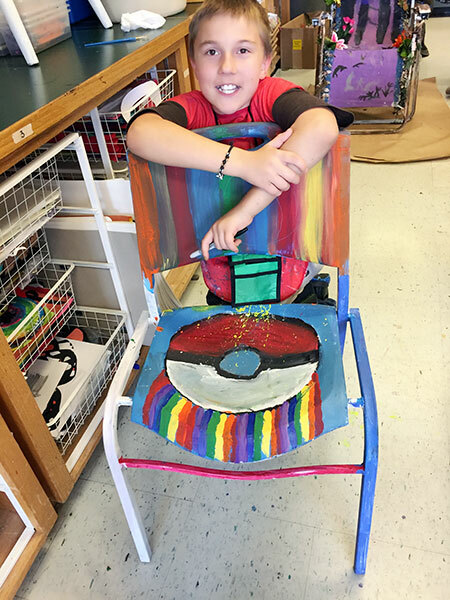 4th & 5th grade art club members were charged with bringing in their own gently used chair to repurpose. 1. Promote. Start early and tell everyone. Use whatever social media is allowed, attend other school events, talk to parents, teachers and ask the students to spread the word. 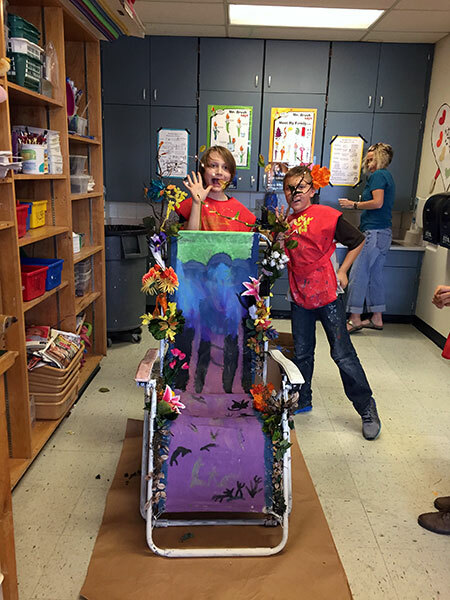 Art students have no problem telling anyone that will listen all about the chair they are redesigning. About two weeks ahead of the event students from other classes got to design posters with their own chair creation and included event details. 2. Size matters. Make sure chairs can be moved by the student. I draw a line at heavy furniture for safety and storage. Students are also encouraged to partner up but teams were optional. I had teams of 1 to 4, as long as everyone got a voice and worked out their differences. 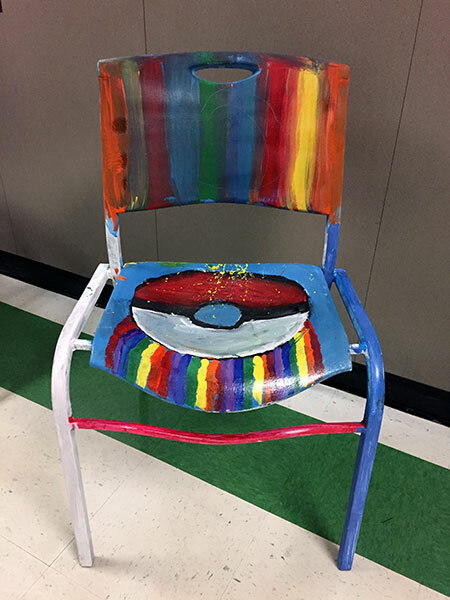 During the preliminary stages, students discussed all different things to sit on. Here are a few from the list: folding chairs, beach chairs, bean bags, crates, stools, a bench, a towel, a stack of books, a tree, a swing, a high chair, a stroller, a wheelchair, a toilet, tubes, a yoga ball, a directors chair, a car seat. It.went.on. 3. Sand. Whatever chair they bring in, sand it. Kids learned that sanding creates a tooth for the paint or glue to latch onto. Tip: Place wet paper towels under the chair to catch fine particles. & keep windows open. 4. Prime. I use 1 part acrylic, preferably white, and 1 part Elmers glue. Even the fabric is painted unless it is replaced. 5. Design. Students worked out their ideas on paper, choosing a theme and colors. Nothing was set in stone and designs could change but a starting point was required before getting paint from the Paint Master (me). 6. Work. Working design issues out meant talking about the process to your partner or whom ever was next to you. 7. Clean up. Tables & the floor were covered in the ugliest butcher paper color I could waste and placed under the chairs to catch waste. Aprons were worn and everyone made space for each other. Before everyone left for the day (3-4:30 Tues & Thurs) sinks were clean, no brushes were left behind, butcher paper was trashed, the paints were capped and labeled with initials for next time, and someone swept. The chairs were placed on high counters along my room and then neatly stacked the next morning. 8. Varnish. I used spray Mod Podge. Spray outside with a mask on and gloves and dirty clothes. You never realize how windy it is until you try to spray paint something. 9. Preview. Set up a preview for the chairs to be seen. I displayed each chair in the hallway with a sign-up sheet ready to go for our silent bidders. Students made posters asking not to touch or sit on the art. Kinders and 1st graders got a private tour while using good museum manners, practicing keeping hands behind them and looking with our eyes. 10. Bids started at $5 and went up from there. This keeps the public informed of the current bid and allows students to see if the decisions they made during the design process created public interest. 11. Celebrate. The silent auction lasted Monday-Thursday and on Thursday night the winners were announced. A one-hour celebration with all the students, their families, and winning bidders made for a festive night. Light snacks and drinks were provided and a few teachers were recruited to help collect money and usher. During this time, students were encouraged to share with the audience what their inspiration was and what they learned during the design process. We raised a little over $1000 but what we really gained were shared experiences that I truly feel my students and their families will remember. I can't thank my administrators enough, Principal Katie Holding and Assistant Principal Brian Braudrick, for their flexibility and the continued support from RRISD's Superintendant, Dr. Steve Flores. Thank you.